A few months ago, I was lucky enough to be the recipient of a Perk Facial, a treatment which manages to exfoliate, nourish and cleanse the face, eyes and lips in just half an hour. 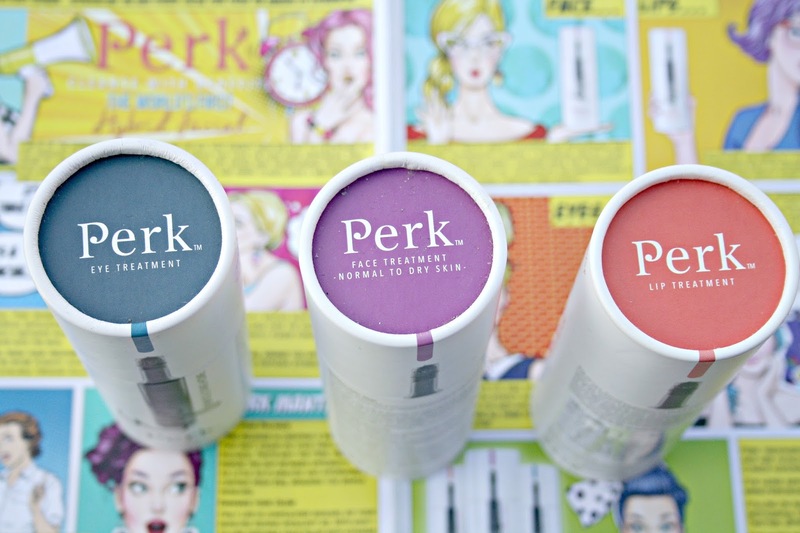 Perk is described as being the world’s first hybrid facial to merge an in-office exfoliating treatment that includes take-home products to enhance your skin benefits. 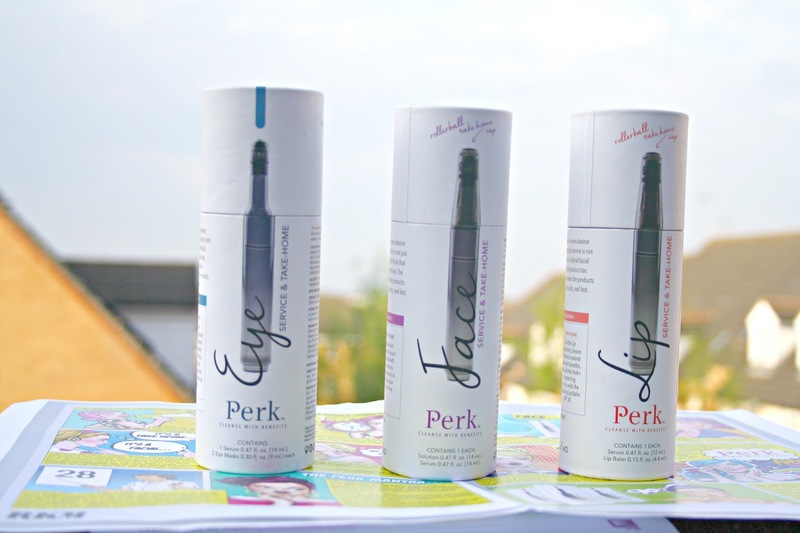 I was given in-depth talks as to what each treatment would do for my skin, I filled out a questionnaire on my skin and then opted for the treatment on my face, lips and eyes using three different products. Perk uses what is referred to as a unique hybrid system which uses patented roller flex technology to gently remove surface layer dead skin cells and impurities due to liquid exfoliation while delivering vital antioxidants. The treatment started with my face and as my skin was being, what I can best describe as 'sucked' by this roller flex, it is totally painless, whilst feeling slightly odd, I could see all kinds of gunk being sucked off and out of my skin. As the pen-shaped machine moved around my face, lips and even around my eyes, my pores were ever so gently flexed as the roller ball embeds nutrients, ensuring absorption and afterwards, my skin felt just incredible. A nourishing solution deeply cleansed skin while an Antioxidant Renewal Serum re-nourishes with key antioxidants including Vitamins A & E, White Tea Extract, and Horse Chestnut Seed Extract. Smooth to the touch, slightly plump and very radiant looking, for once I didn't mind too much about wandering around central London without makeup on! After my face had been treated, which took around 15 minutes, it was then the turn of my lips. Like many people, dry lips can be an absolute nightmare and they also look unsightly too. This treatment managed to remove every single trace of dry skin and what I really liked was the Lip Revitalising Serum which uses key ingredients such as peppermint oil and peony extract to gently exfoliate, hydrate and lightly plump lips. Afterwards, my lips were left feeling plump and smooth and whilst I didn't feel the need to apply any balm, I am a tad obsessed with doing so and did. The part of the treatment I was most nervous about was around my eyes. Anything to do with eyes makes me nervous and slightly on edge, but it couldn't have been more straightforward, painless. The Eye Replenishing Serum which awakens the delicate eye area using ingredients such as green tea extract which brightens dark circles naturally with citric acid. What I loved about this treatment was how soothing it was as it took place. I could have quite happily just laid down as the treatment was done. Afterwards, where my skin feels dehydrated, actually felt hydrated. Naturally depending upon your skins' level of sensitivity you might be a little rosy faced after the treatments, but I wasn't at all, in fact, my skin felt just incredible and later that evening I had an event to attend and the application of makeup was a dream. No need to hope my foundation didn't cling to dry skin because there was nothing for it to cling too. If that doesn't sound fabulous enough, the service and treatments I had gave me some take-home applicators which meant I could continue the routine at home. With enough for a 30-day use at home with instructions on how best to each item. I finished my 30 use some time ago now and admittedly I was skeptical as to whether or not it would be just as good using the home treatments as it was with the first use of the machine and I was wrong because it was just as good. For me, the biggest difference was how my skin feels, not something you can really show in picture form, but to explain. To the touch, my skin is usually soft, but that doesn't mean it is hydrated or even having a good day. 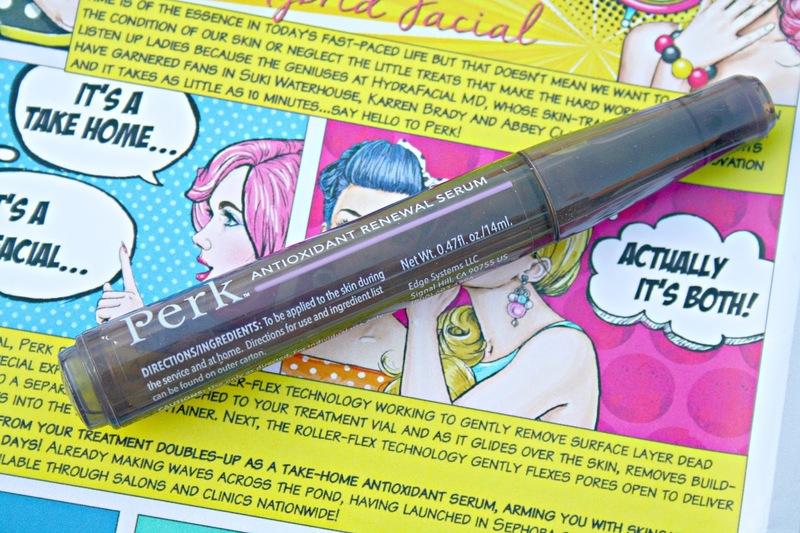 My undereye is usually dehydrated, partly because I spend a lot of my time in front of a computer typing away and whilst I do use mists and face sprays, I sometimes need a little more, a boost if you like and this is where Perk has come in so handy and it was such an eye-opener (no pun intended) treatment. I love the idea that I can have a facial treatment which treats my face, around my eyes and lips to exfoliate, nourish, plump, brighten whilst at the same time deliver vital antioxidants, flex my pores and just ensure soo that gunk, grime and dirt from everyday life stops doesn't build it, doesn't leave my skin looking dull and lacklustre but instead allows it to absorb all the good things I am putting onto my skin and letting them do their jobs. Without question I would have this treatment again, you can mix and match which you have, you don't have to have all three, it depends on your needs at the time. If it is something that does intrigue you, then you can find a salon/clinic near you which offers this treatment here. I could do with a decent facial. I wasn't expecting the products to look like this inside the packaging! I like when brands have a cohesive system like this though. Ooooo this looks so cool! I love the packaging! Oh I bet that was strange seeing the stuff being sucked out of your skin! I really need to look into my skins needs more.